Do your best, and God will do the rest. God expects us to do all we can, and then He will do what we can’t. When Jesus went to raise Lazarus from the dead, He told the people, “Take away the stone” (John 11:39). He could have made the stone roll away by itself, or He could have made Lazarus walk right through the stone, so why did they have to roll it away? 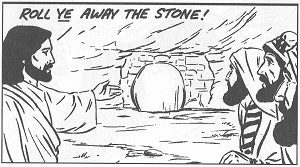 Rolling the stone away from the door of the tomb was something they could do. They couldn’t raise him from the dead, but they could roll the stone away. Jesus said we are to ask, seek, and knock. “For everyone who asks receives, and he who seeks finds, and to him who knocks it will be opened” (Matthew 7:7–8). But if you don’t look, you’re not going to find. Maybe nine out of ten doors you try are locked and you’re only going to find one open, but you’ve got to do what you can. You can’t just sit there and say, “God, reveal it to me!” God expects you to put feet to your prayers, to get out and do a little hoofing and look. If you’re doing your best to please and obey Him, God will do almost anything for you—some of the most amazing things you could possibly imagine!